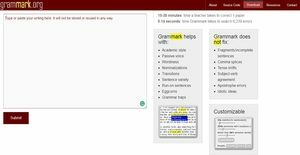 Grammark is an open source grammar checker recommended for students and professional writers. It is an online writing aide and editing tool which has the ability to check grammar mistakes in academic writings such as college-level essays. Among the things that it finds in a document are the instances when a student or writer uses a passive voice, wordy phrase, run-on sentence, and transition. What’s most interesting about the program is that it checks grammatical errors and writing style issues in real time. Thus as users type in a text, it highlights errors instantly and suggests ways to improve the text. Grammark is also customizable which allows users to modify the presets built within the program. Last but not the least, Grammar offers database records for wordiness, transitions, grammar, and eggcorns. Grammark is described as an efficient web-based application. This is because it has the capability to search for 6,239 grammatical errors in just about 0.1444 seconds. It is said that a teacher normally takes 15 to 30 minutes to complete checking a document or paper for errors. Therefore, the application really speeds up the editing of academic documents. Furthermore, Grammark is built to check for specific errors in a document. It searches for sentences that are using the passive voice which tends to obscure meaning and makes sentences difficult to read. Wordiness is another error that the application finds in a document. As a result, users will be able to replace wordy phrases with concise alternatives. Sentence length is another examined factor that affects the readability of a text or document. Grammark provides users with the ability to check whether most of their sentences are too short or long, or if all of their sentences have the same length. This is very important because when a text is written with many long sentences, it is sometimes difficult to understand. On the other hand, if short sentences dominate a text, it becomes oversimplified. Grammark can also check transition words in a document. The use of transition words is needed in organizing ideas so readers can follow the text and won’t get confused. To revise dense sentences that are not necessary, Grammark enables users to pinpoint nominalized sentences. Nominalized sentences are those sentences that contain vague nouns. These nouns are formed from a verb or an adjective, a process known as nominalization. As an example, the noun “improvement” is a nominalization of the verb “improve”. With Grammark’s ability to detect nominalized phrases or sentences, users can make their sentences direct and powerful at the same time, not relying on abstract nouns that can prevent them from conveying the exact meaning of a text. Interestingly, the application calculates the errors committed and gives a score per document. As a result, users will be able to measure their progress and determine which areas of their writing they are prone to commit mistakes at. If you are considering Grammark it might also be a good idea to examine other subcategories of Best Grammar Checker Software collected in our database of SaaS software reviews. Every business is different, and may require a particular type of Grammar Checker Software solution that will be fit for their business size, type of clients and staff and even particular niche they deal with. We advise you don't count on locating an ideal services that is going to work for every business no matter what their history is. It may be a good idea to read a few Grammark reviews first and even then you should pay attention to what the service is supposed to do for your business and your employees. Do you need an easy and straightforward app with only essential functions? Will you really make use of the complex functionalities needed by pros and large enterprises? Are there any specific features that are especially beneficial for the industry you work in? If you ask yourself these questions it is going to be much easier to get a solid service that will match your budget. How Much Does Grammark Cost? We realize that when you make a decision to buy Grammar Checker Software it’s important not only to see how experts evaluate it in their reviews, but also to find out if the real people and companies that buy it are actually satisfied with the product. That’s why we’ve created our behavior-based Customer Satisfaction Algorithm™ that gathers customer reviews, comments and Grammark reviews across a wide range of social media sites. The data is then presented in an easy to digest form showing how many people had positive and negative experience with Grammark. With that information at hand you should be equipped to make an informed buying decision that you won’t regret. What are Grammark pricing details? What integrations are available for Grammark? If you need more information about Grammark or you simply have a question let us know what you need and we’ll forward your request directly to the vendor.